Over millennia, humans have woven myths, legends, and superstitions around solar eclipses. But this phenomenon occurs only because the moon is just the right size and far enough from earth to block out the sun when all three bodies are appropriately aligned. All solar eclipses are, however, not the same. Since the moon’s orbit is elliptical, not circular, its distance from earth varies, apparently changing its size in the sky. So while people in northern India witnessed a total solar eclipse in July 2009, this time it was an annular eclipse. The moon did not cover the entire disc of the sun and it did not get as dark as during a total solar eclipse. In India, the eclipse could be seen by people in the southern parts of Tamil Nadu and Kerala. An annular eclipse was last seen from this country in November 1965. If the plane of the moon’s orbit were not slightly tilted, solar eclipses would be occurring at every new moon. There are, in fact, between two and five solar eclipses in any given year but these are visible from different parts of the globe. But that was not good enough for scientists. 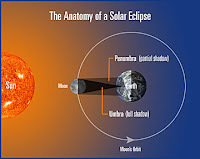 In 1715, the British astronomer Edmond Halley published the first prediction of the path of a total eclipse. Since then, scientists have been travelling to the far corners of the world, telescopes and other equipment in tow, to take advantage of the natural phenomenon. Their work has resulted in some major advances. In August 1868, the French astronomer Pierre Jules Cesar Janssen camped in tobacco fields in Guntur in coastal Andhra Pradesh to make his observations. His work led to the discovery of an entirely new element, helium, which derives its name from the Greek word for the sun. Data from a 1919 eclipse validated a prediction of Albert Einstein’s theory of relativity that the sun would bend the light from stars. A total solar eclipse remains a major opportunity for studying the sun’s corona, its outer atmosphere that is ordinarily not visible. Such investigations are not possible during an annular eclipse. The Indian Space Research Organisation is, however, using sounding rockets fired from Thumba near Thiruvananthapuram and Sriharikota as well as balloons and ground-based equipment to look at changes that could occur high up in the atmosphere during the eclipse. Most important of all, the eclipse is a rare opportunity for millions of people to behold a grand spectacle and learn some science in the process.